This is the type of monologue guaranteed to have you trawling through Wikipedia to find out more about the protagonist Thomas Paine. Born in the 1730s, Paine’s relatively humble origins belie his import on both the American Revolution and the trial of Louis XVI after the French Revolution. 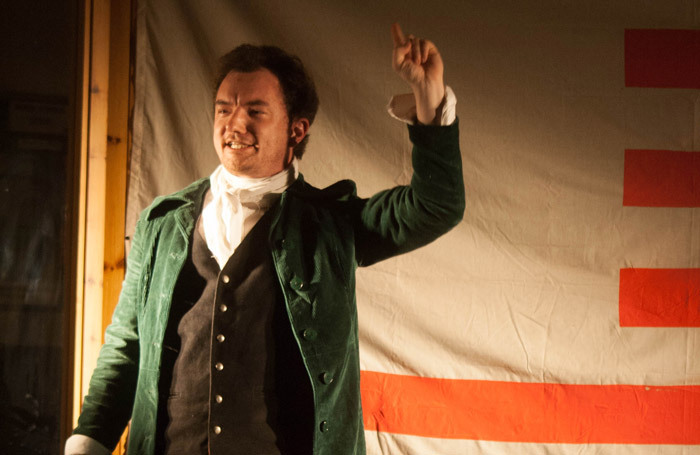 Author and performer Dominic Allen manages to condense the sweep of Paine’s influence into a passionate piece of historical political satire that resonates today. Known for his incendiary pamphlets such as Common Sense and The Rights of Man, Paine cuts an influential figure in the history of democracy. Allen infuses his version with a garrulous sense of humour and touches of meta comedy that thankfully never overpower the simple message of equality for all. Allen’s rousing stage presence provides the fuel to take us vividly through the high-points of both revolutions on the tiny stage, while lampooning his contemporaries, with shrewd takes on Robespierre, George Washington and General Burgoyne re-imagined as Noel Coward. Ultimately, A Common Man: The Bridge That Tom Built is an inspirational piece of solo theatre. Joe Hufton’s slick direction ensures that the message is delivered, but it’s the energy and drive of Allen’s performance that makes it memorable.